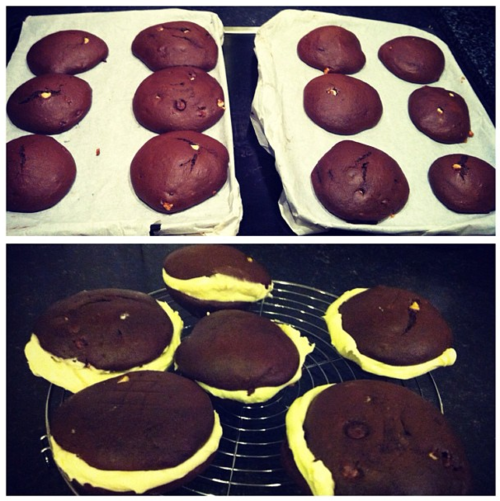 Unorganised Chaos: Oh my Whoopie Pie! After many trips to America I finally experienced the Whoopie Pie! I thoroughly enjoyed making these as they are something I have always wanted to try. You can make all sorts of changes to the recipe which is what makes them so much fun! Have a go and see what variations you can come up with! 3. Leave the milk etc. to cool down a little. At this point, mix together in a seperate bowl the flour, bicarb, baking powder and cocoa. 4. Now your milk etc. is cooled, mix in the flour, sugar and oil in your pan. 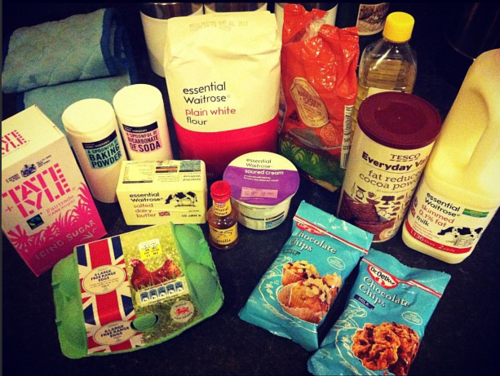 Pour these ingredients into the bowl and floud in with the flour concoction. 5. If you have a piping bag you can pipe 8cm circles with the same amount of spacing between each one. HOWEVER, an easier was it putting two or three dessert spoons worth into a circle, leaving a reasonable amount of space in between each one. Bake them for around 8 minutes, or until, when testing with a skewer, it comes out clean. 6. Leave these to cool on your baking trays; it’s now time for the butter icing! Beat together the softened butter, icing sugar and vanilla, followed by the milk; make sure the buttercream is light and fluffy! 7. When the whoopies are finally cool, take a teaspoon and pop two tsps of buttercream onto the flat side followed by a seconded on top (flat side onto the buttercream. Repeat with the rest of the whoopies.